« How Do You Know If a Blog Has Integrity? For the record, if you need information on exactly how to upload a photograph or graphic to your WordPress.com blog, or even the new version of WordPress, drmike has it in “FAQ for Uploading a Picture to Your WP.com Space and Adding it to a Post”. It seems that Dr. Mike’s blog is down. I’ll try to find a new link, but you can also get similar information on What Do I Do With My New WordPress.com Blog. 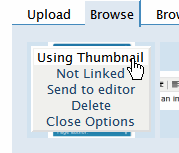 From the menu on top of the image when you click it, “Send to Editor” means it will stick the HTML code into your Post edit textarea window. I thought this was only for those using the WYSIWYG Rich Text Editor and not the do-it-yourself, no frills editor. Surprise! This entry was written by Lorelle VanFossen and posted on August 13, 2006 at 1:38 am and filed under WordPress, WordPress Tips, WordPressDotCom with tags how to use wordpress, wordpress, wordpress help, WordPress Tips, wordpress tutorials, wordpress.com. Bookmark the permalink. Follow any comments here with the RSS feed for this post. Post a comment or leave a trackback: Trackback URL. Great article, I found yours on accident. I just thought I would let you know that you can make money now for your articles. At SayItAloud you can post your articles like you already do, but you can get better exposure and make some decent money in the process when companies sponsor your article. I bookmarked your page and I look forward to your future articles. You can check out our site by clicking on my name.